is located West of Hannibal, MO just off of US-36. From the WEST: US-36 E.
Take the SHINN Lane exit. Turn RIGHT onto SHINN Lane. 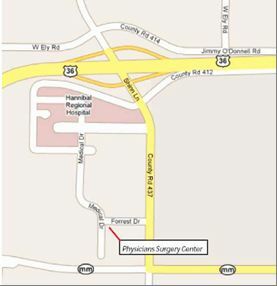 Turn LEFT into Physicians Surgery Center. Turn LEFT onto SHINN Lane. From ILLINOIS: US-36 W (crossing into MISSOURI). Take the SHINN Lane exit. Turn LEFT onto SHINN Lane.